Bowe – fast, friendly and there when you need us. It means we will work with you as the IT Partner for your business. We will listen to you, make sure we understand your ambitions and therefore your requirements for IT Support, Disaster Recovery, Business Software and Cloud Services. 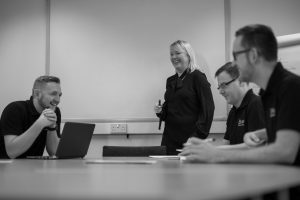 We really do understand how important your IT system is to your business, and our team are dedicated to ensuring you get the best possible value from your investment, with the most exceptional customer care. Based in Newcastle upon Tyne, Bowe Digital have been providing a friendly, professional and reliable service to businesses of all sizes across the North East and throughout the UK for over 25 years. Many of our customers are based in Tyne & Wear, Northumberland, County Durham, and Teesside. Call 0191 214 1750 or email us enquiries@bowe.co.uk to discuss your IT requirements.